Dec. 30, 2007. The New England Patriots were 15-0, one win away from a perfect regular season. It was something that had only been done once before. The 1972 Miami Dolphins were the only other team to do it. The Patriots were going to have to get past a feisty New York Giants team that refused to quit. Tom Brady and Randy Moss were each on the brink of breaking records. For Brady, it was Peyton Manning's record of 49 touchdown passes in a season. For Moss, it was Jerry Rice's single-season record of 22 touchdown receptions. With so much on the line, it would have been easy to see the Patriots crack, but they didn't. At least not this time. It was a battle from the very beginning, as the Giants scored on their opening drive. Eli Manning connected with running back Brandon Jacobs for a seven-yard score to put the Giants ahead 7-0. It capped a seven-play, 74-yard drive that took four minutes. The Patriots then answered with a Stephen Gostkowski field goal, but it took them 12 plays and only 28 yards to get it. The Giants were swarming around Brady all night, and you could tell he wasn't feeling totally comfortable. After a Giants three-and-out, the Pats got the ball back with a chance to go ahead for the first time, and they'd do exactly that. Brady hit Moss for a four-yard strike to make it 10-7 Patriots. With that touchdown, Brady tied Manning's record, and Moss tied Rice's. The Giants wasted no time getting that touchdown back, however. On the ensuing kickoff, Domenik Hixon ran 74 yards for a touchdown that put the Giants back on top 14-10. It was a huge kick in the gut to the Patriots, who had seemed to find some momentum on their previous drive. But once again, they found themselves in a hole that you knew they could dig themselves out of. The 2007 squad didn't face much adversity throughout the year, and this was easily one of their toughest regular season games. New England only managed six more points during the first half. Two straight Gostkowski field goals put them ahead 16-14. It wasn't the kind of game where you felt safe with field goals, though. Mostly because the Giants kept answering. With 18 seconds to go in the second half, Manning found tight end Kevin Boss for a three-yard score to put the Giants up 21-16 going into halftime. This was one of the very few instances where the Patriots trailed at halftime this season. The team probably wasn't used to it, and the fans certainly weren't used to it. With the way the Giants were matching the Patriots at every turn, you had to worry if maybe the Patriots luck had run out. Things started to look even dimmer when the second half opened. The Patriots went three-and-out to open the latter half and the Giants pounced on them right away. In just seven plays, Manning was able to put the Giants ahead 28-16 when he connected with Plaxico Burress for 19 yards on a third-and-nine play. The 12-point deficit the Pats were facing was the largest of the season for them, and they'd need a championship-like effort to regain the lead. These Patriots had a ton of carryovers from Super Bowl's past, so nothing seemed to phase them. For Brady and many others, they'd been faced with way worse in the past. They began to quell some fears when they answered the Giants' latest touchdown. Brady took them 78 yards in eight plays, and Laurence Maroney scored on a six-yard run. 28-23 Giants. After the Giants' second straight punt, the Patriots got the ball back with just under 10 minutes in the fourth quarter and a chance to make history, but time was running out. Brady and Moss needed to hook up for one more touchdown to break respective records. More importantly, the Patriots were still trailing and needed to get back in front. Brady found Moss for a 65-yard missile to not only put the Patriots ahead 30-28, but Brady and Moss were new record holders. That was Brady's 50th touchdown pass of the season, and Moss's 23rd touchdown reception. Moss's record still stands today. The irony of it all was that Brady tried to connect with Moss on the play before the touchdown, in the exact same fashion, with the exact same look. Moss dropped the ball, and everyone was stunned. Luckily, they didn't waste their second shot at it. So now two of the three things the Patriots set out to do were etched in stone. But a 16-0 regular season wasn't a sure thing just yet. Things were looking good, though. Ellis Hobbs intercepted Manning on the next Giants drive, and the Patriots went ahead 38-28 on another Maroney touchdown run. But the Giants weren't about to roll over and die. Manning took the Giants 61 yards in 3:32 minutes to bring the Giants within 3, as he found Burress again for a three-yard touchdown. There was only one minute left until the Patriots achieved perfection. The Giants had to recovered an onside kick if they wanted to have any chance of denying New England perfection. Everyone in New England was holding their breath. For the Giants and their fans, Big Blue had nothing to play for, as their wild card spot was already guaranteed. Could the Giants, a team that was 3-4 at home, really do this to the juggernaut that was the New England Patriots? The Patriots recovered the onside kick and ran out the clock to become the first team ever to finish the regular season 16-0. History was made in almost every sense of the word. Brady was the king of touchdown passes, Moss was the king of touchdown receptions, and the Patriots were on their way to becoming the greatest team in NFL history. They were and still are one of the greatest sports stories of all time, but not necessarily for all the right reasons. 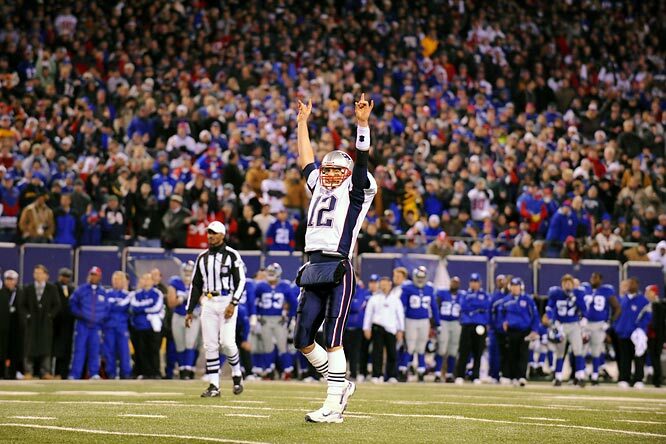 Just a little over a month after this game was completed, the Patriots and Giants matched up again in Super Bowl XLII. The Giants had run the table as a wild card to make it to this spot, and the Patriots were looking to become the only team in NFL history to go 19-0. Many believed the Patriots wouldn't have too tough of a time handling the Giants due to the fact that they'd played against each other already during the season. Everyone was wrong. Dead wrong. The Giants, in one of the biggest and greatest upsets in the history of sports, destroyed the Patriots' hopes of true perfection, winning Super Bowl XLII. It was and is still one of the most crushing losses in Boston sports, one that some (myself included) haven't gotten over. That's why this Sunday's game against New York has a little something extra for those who remember that Super Bowl, as well as Super Bowl XLVI, which New England also lost to the Giants. Obviously these teams are much different now, but the feelings between the fan bases, and maybe some of the players who remain from those Super Bowl teams, may still linger.